Join the Game — Promotional piece / Banner ad for The Good Cards. Promotional flyer — Promotional flyer created for Mother's fast food company. 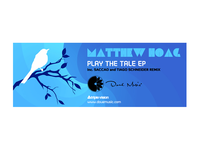 Play the Tale EP — Promotional banner for the first EP released by Doué Music.